Apple's newest iPad looks a lot like Apple's last iPad — and it even sells for the same price as the previous model, so we're not going to complain. It maintains the same size and shape, with a fairly wide bezel around its 9.7-inch Retina screen. While it would have been nice to see some more updates to the design, that's not necessarily a bad thing: the 9.7-inch iPad is Apple's most popular model, with a screen that's reasonably sized without the bulk of the 12.9-inch iPad Pro. The updated iPad also has the same 8-hour battery life, cameras, and Touch ID sensor as its predecessor. The features that make this iPad stand out aren't the sort you'll notice by looking at it. The processor has been upgraded to Apple's A10 Fusion chip, and while that's not Apple's newest processor, these iPads speedier are speedier than the last generation — making them better suited to multitasking and running high-end apps. Apple brags that it's faster than most Chromebooks, but considering the rock-bottom prices of Chromebooks, they still have a lot of appeal. 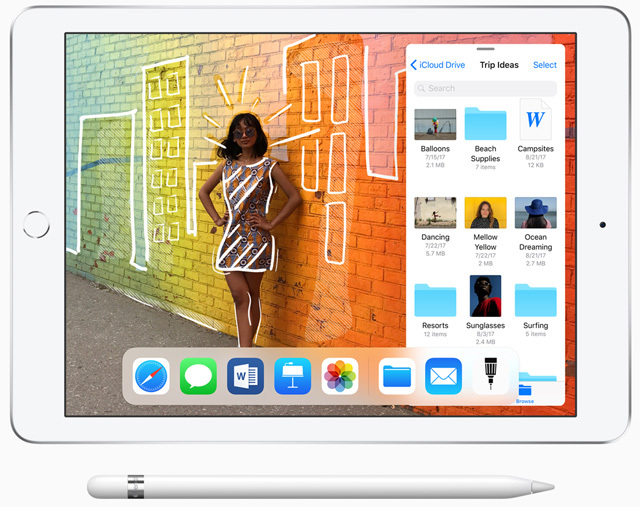 The most notable addition is Apple Pencil support — which means that behind that Retina display there are upgrades so the iPad can sense the pressure and tilt of the Pencil for natural writing. It's a feature you could only get on the pricey iPad Pro before, and now it will be a lot more affordable. But just how affordable? The new iPad starts at $329 for a 32GB Wi-Fi model, and bumping it to 128GB or adding LTE will add an extra $100 for each feature. 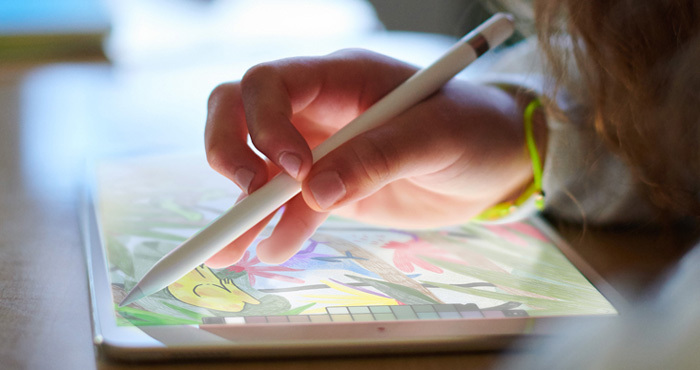 The Pencil will also be another $99 if you're looking to write or draw on your new iPad. And if you want a keyboard for typing, expect to spend around $100. One disappointment is that there's no Smart Keyboard connector on this iPad, so you're stuck with a Bluetooth keyboard. The iPad Pro offers a slim Smart Keyboard that you simply snap on instead of hassling with Bluetooth pairing — and considering this basic iPad picked up other iPad Pro features, it's a shame the keyboard wasn't one of them. All in all, accessories alone could push the price of this "budget" iPad sky high. This iPad is aimed at the student market, which has been taken over by Chromebooks. But you can find a decent Chromebook for under $200, which still gives them a significant price advantage. 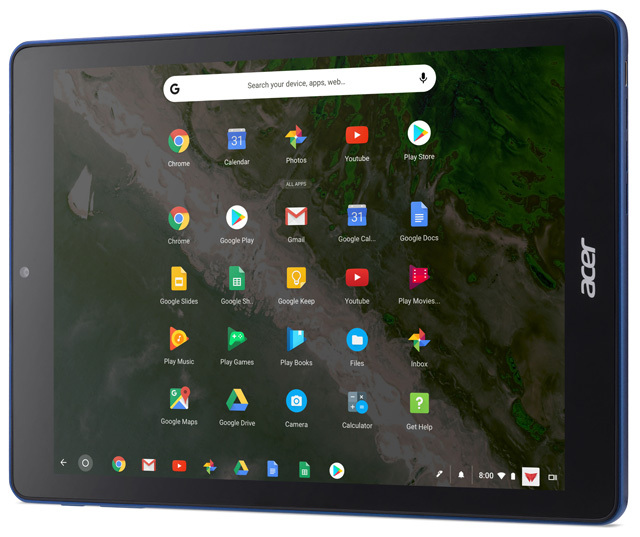 The new Acer Chromebook Tab 10 also gives the iPad a run for its money. This 10" tablet is the first to run Chrome OS, and it's very similar to the iPad in features — but includes a stylus. Also priced at $329, will be an excellent tablet option, though it doesn't start shipping until next month. The iPad does have an app advantage, with more than two million apps in the App Store and more than 200,000 education apps. That's something that Chrome OS just can't match, even with the ability to install Android apps. The iPad is also getting some app updates to help it compete with the cloud-based suite of Google apps on Chrome OS. iWork is getting a makeover, with updates to Pages, Keynote and Numbers that make collaboration easy and add support for Pencil to annotate and draw right in your documents. There are also new versions of GarageBand and Clips, adding some kid-friendly features including animal sounds and new filters. All of these will be available for free this week for all iPad users. There are also a bunch of features just for students, including multi-user support for iPads in classrooms — which sadly won't be available to ordinary users, though it could be extremely useful for families. The Classroom and Schoolwork apps will also let teachers keep tabs on what kids are working on, give out assignments digitally, and even mark up schoolwork. This will definitely make the iPad a handy addition to the classroom, and it comes at a slightly discounted price of $299 for schools. That's still more than a Chromebook, but Apple hopes apps and easy classroom integration will sell these. But despite the education focus, the new iPad is available for everyone. You can order your iPad now, and it should ship this week.